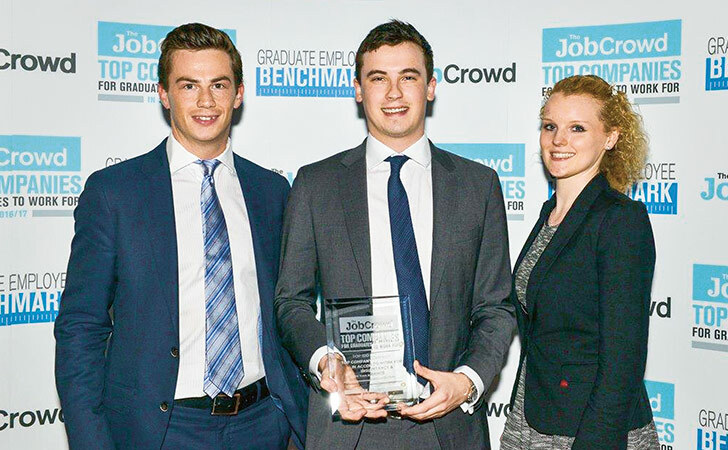 Three of our former graduates attended the awards ceremony at the Intercontinental Hotel in London to collect a 2016/2017 Top Company award from TheJobCrowd. In 2016, Swiss Re won the award for “Top Company for Graduates to Work for in the Accountancy & Insurance Sector” for the second time in a row. We received this award from TheJobCrowd (www.thejobcrowd.com), a popular graduate job review website in the UK. Our graduates were asked to complete a survey on their work experience at Swiss Re. The survey covered questions such as: what are the best things about your company, what attracted you to the company, how do you rate the work-life balance, training and ethical/environmental balance. The results from our graduates were overwhelmingly positive.